Do I have to whistle really loud to hail a taxi in NYC? In the movies, we usually see that people whistle really loud and yell "TAXI!" in order to hail one. I can't whistle like that for the life of me. Where I live I usually raise my arm silently and make eye contact with the driver and he knows. I googled this for a bit and all I found are conflicting answers. Some say it's frowned upon and makes you look like a tourist. Other websites even attempt to teach you how to whistle to hail a cab. I'd appreciate a definitive answer on this. What's the correct way to hail a taxi in NYC? I've lived in New York City for most of my life, and I've never whistled for a taxi. I have, however, hailed many taxis by silently raising my arm or indeed just making eye contact without any additional gesture. There have been one or two occasions when I've yelled "taxi," but only when the vehicle was on the other side of a wide avenue and the driver's window was open. It's not terribly effective. Grew up in New York City, and the only people who whistle for taxis that I have seen are doormen—and they do it with an actual whistle. Even then, I suspect they are only doing it for effect or maybe tradition. The only places where doormen go and hail a cab for people are really upscale places. A doorman alone is a perk people pay for in New York, and most places that have one can’t have him or her abandoning the front desk to look for a cab—you only see this when the lobby has several dedicated staff members, and that costs. In my mind, the idea of hearing a whistle for a cab is strongly associated with, say, Park Avenue or Central Park West. So I wouldn’t be surprised if the whistling was more for the sake of “advertising” how upscale a place is than it is for actually securing a taxi. After all, the streets are noisy and cabs are looking for raised hands, not listening for whistles—and the doorman still goes to the curb/line of parked cars and raises his or her hand. Anyway, aside from doormen at really ritzy places, everyone else hails a cab mostly by standing somewhere they can be seen from the street (the edge of the curb, the edge of the line of parked cars, etc.) and raising their hand. In rare-ish, circumstantial cases, a verbal or whistling hail might be thrown in, but honestly cab-hailing only seems to get audible when someone “steals” a cab—and then the yelling starts, at the person who did it and at the cab for letting them (at which I’m sure every cabbie just rolls their eyes). The media depicts New York as a city where you step out the door, whistle, and a taxi pulls to the curb. I have seen so many people that try to do just that. There are three major components: They have to see you, they have to register that you are a prospective fare, and they have to be able to stop to pick you up. Make sure the taxi can spot you. If you're in a large crowd, a driver may not be able to see you. Also make sure that you can see oncoming traffic, which means they should be able to see you to. This can mean having to walk to a better position. If there are a number of people trying to hail cabs, walk a block up the street so that you're the first fare drivers see. Get the attention of the driver. Whistling may not always work, because the drivers may not hear you. It will, however, attract the attention of other pedestrians, which may not be what you want. Raising your arm, or waving, is another way to stand out as wanting a ride. You can try yelling "TAXI!" Eye contact is also great. These all let drivers know that you are a prospective fare. Be accessible. Try to find a spot where there is space for a taxi to pull over to the curb. This is safer for them and you, and you get to avoid having other cars honking if you are not fast enough getting into your taxi. (Buildings that have loading zones outside the main entrance are ideal.) A taxi is less likely to stop short in busy traffic to pick you up, if the likelyhood of them being rear-ended is too high; your fare isn't enough to cover their deductible. A great way to do all of these at once is to find a taxi stand, which tend to be outside major stations and hotels (which is also where there is a higher demand for taxis). Find a safe spot to get picked up at. If a driver sees two potential customers. He will always pick up the person who is in the safer area, or at the taxi stand (not the person who whistles the loudest or gestures like a wild person). This is not just because of accidents (as Chad has already said), but also because of parking/traffic tickets. In New York, everybody gets tickets, taxis, UPS, FedEx, other delivery trucks, etc. Police officers are lenient with taxi drivers and delivery truck drivers, after all, it's not like drivers have that much choice, but if they see that a driver could have made their fare walk to a safer location, or if they see that a taxi is blocking a busy crosswalk, they're going to want to teach that driver a lesson. Ask a hotel doorman to order your cab. You can tip them, but they also get kickbacks from cab drivers (so they won't have any problem helping you even if you're not a guest of their hotel). During peak rush hours, a hotel doorman is more likely to successfully get you a cab. And it's not just because of their distinct wooden whistle, it's because during the off-peak hours, they can blacklist the cab drivers that refused short fares, or they can blacklist the cab drivers that didn't show up when called because they picked up someone else on the way. Use an app. Uber and Lyft have apps, but these days taxis have apps too! If you use an app, the driver is less likely to say that his credit card machine is broken. And if you enter the destination in advance, it's less likely that your driver will misunderstand it, or that he takes you the long way around (because at the end of the journey, you usually get a map of the journey you've taken along with your receipt). Also when you order a cab through an app, you can track the cab making its way to you in real-time on the map of the application itself (which is better than if you had just called for the cab by phone). And last, but not least, Uber/Lyft/Taxi apps can act like hotel doormen, they can penalize drivers who refuse to take you once they find out your destination and they can also penalize drivers who don't make their way to you for whatever reason. If you use an app, find a safe location for the pick up, then double-check the location shown on the phone. GPS location can be distorted because of tall buildings. But even in general, GPS location can be inaccurate because passengers order their cab from inside of buildings and don't double-check the pre-filled address. In addition to that, the better apps may even tell you to walk to a safer location or to a different location to make the pickup easier. And finally, if you use an app to order a cab for the very first time, google around for a promo code for the particular taxi company you want to use, or google for a promo code for the particular ridesharing company you want to use. If it's really the first time you ever use them, those promo codes can save you a little bit of money. The same can be said about those promo codes for those new shared bikes, electric-assisted bikes, electric scooters, and/or shared cars. Those promo codes are really the result of too much venture capitalist money. It's been said in the other answers, but whistling is unlikely to do anything. Hearing a random whistle (assuming they even hear it) while navigating through NYC traffic isn't going to get a driver to start looking around to see who did it; it's just not practical. And as other answers said, it's enough to simply raise your arm and look at the drivers as they go by. If they are available, they will see you (and often race across a few lanes to get to you). Which brings me to my next point, how to tell if the cab is available. The most important thing: learn to read the light! 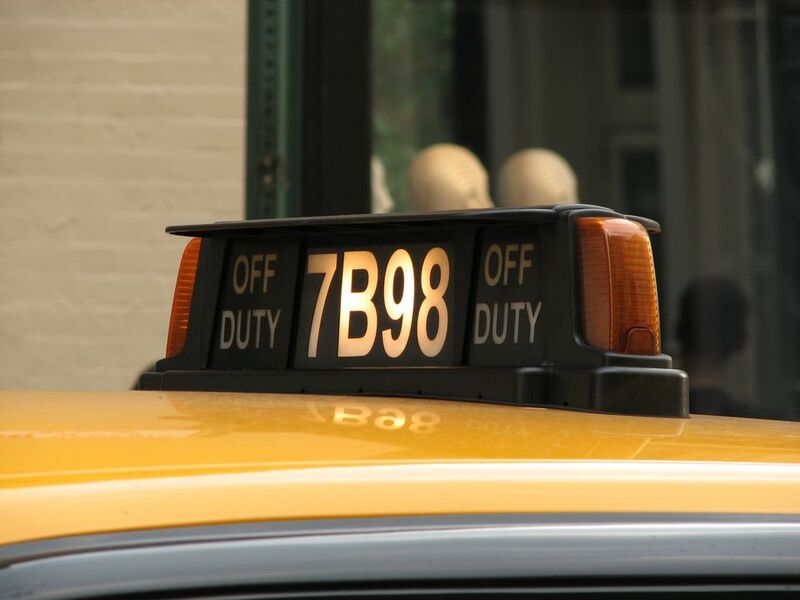 Completey Off: this means the cab has a fare. Do not hail. All Lights On: the important part of this is that the "Off Duty" lights will be on. This means the cab is off duty: Do not hail. You will be much more successful catching a cab by knowing this. You can tell the tourists easily because they stand out there waving their arms and yelling "taxi" at every cab even though 4/5 of them aren't able to be hailed. But this is still important to know, because despite the simplification it seems the biggest problem is getting people to know the light has meaning at all. As others have said, whistling is unnecessary. One thing I haven't seen others say yet: chances are, you'll want to walk over to whichever avenue is closest. Taxis that are looking for fares usually go along avenues (north-south), not streets (east-west). This is what a New York taxi driver himself, Eugene Salomon, has to say about it. [...] standing on the sidewalk, a faux pas for a New Yorker, who will always step out a few feet into the street (so he can be seen). He has written about it further for Time. -Never stand on the sidewalk. Always take a few steps out onto the street to make yourself more visible to the cabbie. -Lift your arm straight up in the air, no bent elbows. -Make eye contact with the driver so he can be sure that it's his cab you're waving at. -Begin your hail from a full block away, to allow the driver time to change lanes smoothly. He also recounts a tale of what can go wrong and who will end up in the taxi you wanted to take. [...] After a few seconds of red-light waiting, I noticed a welcome sight down at the corner: two people were standing on the sidewalk, looking at me and waving their arms in the air - my next passengers. I knew they were tourists because, as noted, they were standing on the sidewalk, but who cares? A customer is a customer and, besides, I love tourists. Now, aside from the sidewalk blunder, they were also making another mistake that is characteristic of the uninitiated - instead of walking to me, they were waiting at the corner for the light to change and for me to approach them. It was quite busy on the streets at this time, with not too many available cabs around, so standing there and waiting was a risky thing to do. And they paid the price. Suddenly, coming from behind, was a twenty-something guy without inhibition. Raising his arm into a hail, he walked right past the couple on the corner, approached my cab, and got in. He then called out to his friends, another guy and a girl, who followed. It didn't seem to me that they were aware of the others' intention to obtain my services but, even if they had been, it's not my role to intervene. I've found through experience that it's best to stay neutral in these affairs. And, really, a cab isn't truly "taken" until someone is literally sitting on the back seat. Lifelong NY'er: No, you do not have to whistle - that's only in the movies. Maybe at one time it was commonplace, but these days no. In fact, it might be considered demeaning to whistle. There's nothing to be embarrassed about when taking this approach: Remember that drivers like taking good fares and making money, and time is money. You're helping the driver make money by moving quickly with this approach. Instead of wasting time and gas fighting through traffic and/or cruising around, to get to the next fare, they're back in business immediately. If the driver doesn't want to take you where you want to go, they'll either tell you they can't go there (and perhaps offer an excuse), or tell you they're at the end of their shift and going off duty. So, you get out of the cab and try again. No harm, no foul. That approach can also help you in another way: The driver will be more careful about taking the most efficient route to get to your destination, because you've shown them you know how get things done in NYC. There are always several ways to get somewhere, especially in a town like NY. A good, honest driver can get your there in half the time, for half the money, as opposed to a bad or dishonest one. Your attitude will likely help the driver to be a "good" one. Not the answer you're looking for? Browse other questions tagged new-york-city taxis etiquette or ask your own question. Is it normal/expected to tip taxi drivers in the UK? Is the NYC CityPASS a good deal?